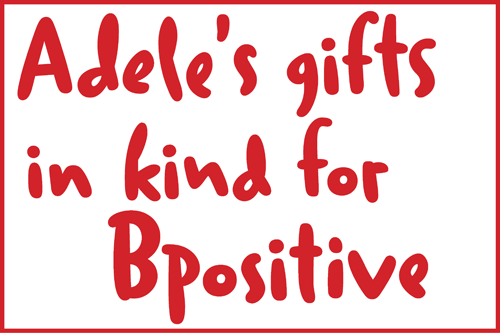 Bpositive Patron Dr. Adele Fielding is turning 50 years old and to celebrate her milestone birthday Adele is requesting that instead of receiving gifts for her birthday, she wishes for people to make a small donation to Bpositive. If you are kind enough to think of a birthday gift, the thing Dell would most appreciate would be the easiest option for all parties. She would love for you not to have to wrack your brains and trudge around the shops and for her not to carry a pile of stuff home whilst drunk, cram said stuff into bursting cupboards and later recall who bought what for the thank you notes. The perfect solution is for you to make a small donation to Bpositive, a newly formed charitable organisation which supports patients with Acute Lymphoblastic Leukaemia. Dell is proud to be associated with this Charity which offers pragmatic and relevant support - with a focus on social media and internet communication - to patients who are stuck in hospital for inordinately long times receiving the gruelling treatments that Dell plays a part in designing and administering. If you would like to congratulate Adele on her 50th birthday by making a donation then please select the donate button below.